What Is An Experiential Astrology Session? I have gotten through my blogging yips for now. Today I am bursting at the seams to write. The inspiration comes from doing more and more Experiential Astrology Sessions. I guess the big question is – What is an Experiential Astrology Session? Here goes. People are arriving at my door, not so much with a desire to fill their inner hard-drive with a heap of astrological information but rather with a sincere need/passion/hunger to sort out various issues in their lives. Usually these are related to work (creativity), relationships of all kinds and existential angst (the meaning or significance of this mysterious life). Once presented with an issue, we can move in a variety of different ways. The simplest is to take what appear to be the archetypal characters most aligned to the issue (the relevant signs, planets, houses from the birth chart) and lay them out on a couple of cushions on the floor. 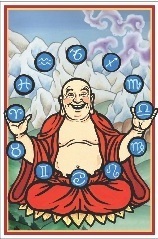 For example the issue may be relationship, so we pick Venus and Mars. At this point I lay out three cushions, or chairs. One is for the person’s normal garden variety self and the others are for each of the planets. (Venus and Mars). Then we start exploring. Essentially the process is like Gestalt or Voice Dialogue, or Psychodrama. I get the person to sit on the cushions one at a time and explore what it feels like to be that unconscious part represented by our example planets, Venus, or Mars. This is a slow, in depth journey of energy, feeling and insight that brings to light what resistances might be there, what resources might be there and what bearing this resource, or resistance has on the issue presented. That alone is often revelatory. The part on the second cushion is often very different from the first, and has a completely different often contradictory perspective on the presented issue. Having identified both, we then come back to the middle and check to see how it feels to have these energies bubbling away on the inside. The process from here on in is two-fold. The first step is therapeutic. It is all about learning to love what we have found so far. This happens always and spontaneously as a result of investigating the effects of not loving each part. Once that is seen, acknowledgement and acceptance follows like night follows day. The second step is the meditative step. This can happen in a few different ways depending on the person’s type, present space and lord knows what else. It can happen by bringing all that we have found so far into the heart. It can happen by simply finding the balance or the mid-point between the two parts. It can happen by holding the paradox. It can happen by peeling away the different parts and discovering that none of them are actually who we are – by dis-identifying. There are all sorts of things that can happen at this point but they all involve centring in one way or another. So – in this way Astrology works as a way to ease the conflict of the presenting issue and as a way to use the presenting issue as a path to centring, meditation, witnessing. How good is that? And how much fun is that? There are other ways to do the same thing in a session. We can find the opposing threads within one archetypal energy, (e.g. the love and the hate inside Venus) or we can lay out whole slabs of the birth chart in a circle on the floor and walk through the various flows and obstacles that make it unique. The methodology is basically similar, though the physical approach may be different. Step one – acceptance, acknowledgement, self-love – and step two, witnessing, meditation. The beauty of this approach is that it is an experience as opposed to a Birth Chart Reading which is really only an intellectual exercise no matter which way you look at it. This means that an Experiential Astrology Session can actually change us, not just inform us. Also, and perhaps the most amazing thing, is that it leads to the person coming for the session finding the resources within required to sort out their own dilemma’s. The symbols of Astrology hold within themselves, all sorts of positive, transformative possibilities. An Experiential session is fundamentally client-based and therefore empowering. My job is to direct traffic, not to impart knowledge or advice in any way. I am having a blast with this stuff and would love more people to take a punt and come for the journey. I am presently in Brisbane, which makes me very available for SEQ locals – but I am available to travel anywhere there is interest, a grounded and friendly organiser and sufficient need. Talk to me! My Book “Astrology For Those Who Won’t Admit They’re Interested” is out there awaiting your purchase. If your local bookshop has difficulty trying to order it, you can get it on-line at www.boolarongpress.com.au or www.amazon.com If you have any trouble getting it there or need further details (ISBN etc) please contact me. My e-mail address is above – or leave a comment on this site.